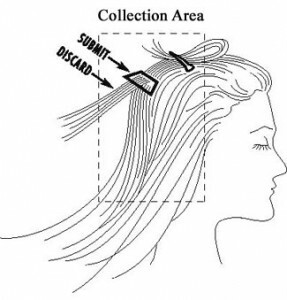 Detox result analysis can be accomplished with hair analysis. This form of detox result analysis show that Total body cleansing works! Read the background information on one of our clients below and then look at his hair analysis report get the proof of how just how successful total body cleansing with the ionic detox foot baths can be. A client came to Optimum Health indicating that he was turning yellow, extremely tired and drinking two gallons of water a day. His hair began to gray when he was a teenager. We recommended a supplemental routine along with total body cleanses (ionic detox foot baths) 2-3 times a week. We also sent to his physician to see if he should take any medical steps. In turn, the physician sent him to a kidney specialist. Then, the specialist diagnosed him with jaundice of unknown etiology. In fact, this simply means that he was turning yellow and the physicians didn’t know why. Since Optimum Health policy is to try to address the underlying problem that is preventing healing from taking place, we had to ask, “Why”. Could there be a toxin in his blood causing a problem? To see if there was something in his blood causing a problem, we did a total body cleanse on him. Among other things, he released an excessive amount of metal from his body into the detox water. Right away he felt better. Why? 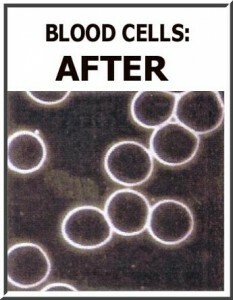 Because he no longer had so many toxins floating around in his blood. 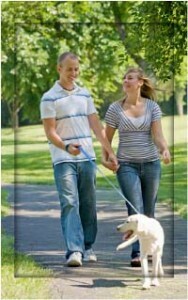 You can see the Proof that this happens in the pictures below. In the “BEFORE” picture the cloudiness represents the toxins that need to be removed. The “AFTER” picture was taken immediately after finishing the whole body cleanse. Notably, the cloudiness is gone. Indeed, the process removed the toxins. Within 15 minutes of beginning this cleanse process, the above mentioned client no longer had any yellow coloring. To tell the truth, we were quite surprised. We had not expected this. 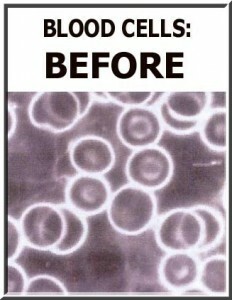 This was, in fact, more proof that his blood was being cleaned. Indeed, this was absolutely wonderful! However, he released an excessive amount of metal into his detox water. Therefore, we decided to get a hair analysis. The hair analysis indicates the types of metal stored in his body. This is a good indicator of what his body might be releasing. We were hoping to match the metals stored in his body with the alleviated symptoms. Hopefully, this would account for his improvement in how he was feeling. As a result, we collected his hair sample and sent it to our licensed lab. 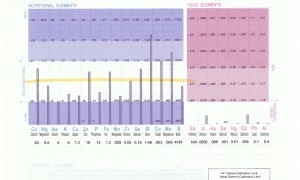 We anxiously awaited the report on the levels of over 30 different elements. Look at the blue area. These are nutrients that your body needs to have in amounts below the yellow line. There are 7 nutrients that are too high. Of special note is the Mo (Molybdenum) as it will cause problems that will make a person turn yellow (jaundice). Now look at the pink area. This whole area should not have anything present as these are all poisonous substances. The mercury and lead combined can cause a person to feel extremely tired and unable to walk across a room due to fatigue. The hair analysis accounted for all health issued experienced. After detoxing at least 2-3 times a week for five months, the hair analysis was repeated. The little squares represent the values of the previous hair analysis. In the blue area, notice nearly all values are in the correct area just under the yellow line. Notably, some of the nutrients that were high have dropped to less than half of what they were. In fact, some have dropped to normal. Most impressively, there was no change to the nutrients that were already normal. 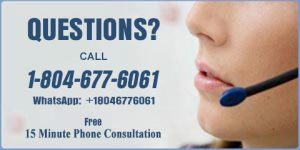 As a result, we can begin concluding that the detox equipment does not remove elements that the body needs to keep. Indeed, the Mo (molybdenum) is now normal and he does not turn yellow anymore! Notice that, in some cases, the pink area has << as a result value. This indicates that a result is so low that the machine could not assign a value to it. Impressively, the process reduced two of the metals to such a small amount. 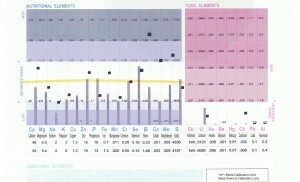 The cadmium (Cd) that was fairly high is now extremely low. Unfortunately, the uranium (U) has increased. This fits with the client stating that he began to taste metal again. It took some time, but we finally figured out why the increase in uranium occurred. He spent a lot of time in his garage working on cars. Unfortunately, there was a crack in the concrete floor of his garage. The crack allowed radon to enter his garage. He was spending a lot of time in his garage breathing in the radon. In turn, the radon became uranium in his body. Therefore, this was a constant source of uranium that needed to be eliminated. Therefore, he fixed the crack in the floor of his garage. Afterwards, his uranium levels were eliminated. Total Body Cleanse Success: Feeling Great! As expected, with a normal molybdenum level, the client does not turn yellow anymore. With the lead nearly gone and the mercury extremely low, he does not get fatigued and sleep excessively anymore. In fact, he is quite energized!